Luxor 2 is an action-oriented casual puzzle game developed by MumboJumbo. 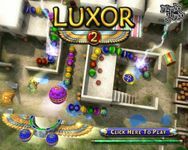 First released in 2006, it is the sequel to the original Luxor, which was released in 2005. The title can be played online at several different sites, and can be purchased for Microsoft Windows, Mac OS X, and Xbox Live Arcade. Source: Wikipedia, "Luxor 2", available under the CC-BY-SA License.